Today we celebrate the holiday of Tu b’Shevat, the “new year for trees”. It is customary to consume a variety of fruits, especially the Seven Species of Israel (pomegranates, olives, dates, figs, and grapes, plus wheat and barley). In Israel, it has become customary to plant a tree. Some are familiar with a Tu b’Shevat “seder” that parallels the Passover seder and includes drinking four cups of wine. This seder emerged in the mystical circle of the Arizal (Rabbi Isaac Luria, 1534-1572), though wasn’t publicly written about until nearly two centuries later. According to the Kabbalistic seder, one should actually eat of three types of fruits: those that are inedible on the outside but edible on the inside (like nuts or bananas); then those that are edible from the outside but not on the inside (like dates or olives); and finally those that are entirely edible (like figs or blueberries). This represents a transition from tough kelipot to no kelipot at all. 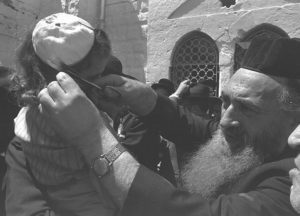 The term kelipot literally means “peels” or “husks”, and plays a huge role in the Kabbalah of the Arizal. Man’s purpose is to symbolically break the kelipot and extract the sparks of holiness trapped within. Thus, on Tu b’Shevat one starts by eating fruits with a tough exterior, then proceeds to eating fruits with a smaller kelipa (a hard pit deep inside), and finally eats a completely edible fruit with no kelipa. The last represents a perfect, restored world. It is symbolic of the Garden of Eden where, in Jewish tradition, all trees and all parts of trees were completely edible—even their bark and wood! In ancient times, Tu b’Shevat served a far more practical function. As the Mishnah states (Rosh Hashanah 1:1), Tu b’Shevat is one of the four “new years” of the Jewish calendar, and begins a new agricultural cycle. It opens a new season for tithes, and was vital for tracking the ages of trees. According to the Torah, it is forbidden to consume the fruits that a tree produces in its first three years (Leviticus 19:23). This is known as the mitzvah of orlah. It is therefore vital to know a tree’s age, so Tu b’Shevat is significant as it is considered a tree’s “birthday”. Having said that, the same Mishnah says that Rosh Hashanah (the first of Tishrei) is the new year for “planting”. This suggests that Rosh Hashanah might be a tree’s birthday, too! That is indeed the case, and results in some interesting legal ramifications. The Talmud discusses them at length (starting on page 14a of Rosh Hashanah), as do the various commentators and legal authorities. One of the points to be considered is that a tree does not have to be a full three years old, rather it can be in the third year of the agricultural cycle. So, for example, if a tree was planted several weeks before Rosh Hashanah, it may be counted as being in its first “year”. Once Rosh Hashanah hits, the tree enters its second year, even though it has only been alive for several weeks! Halachically, a tree must be planted at least 44 days before Rosh Hashanah to qualify. If it is planted within 44 days before Rosh Hashanah, then it would have to wait until the next Rosh Hashanah for its first birthday. Tu b’Shevat, meanwhile, plays a larger halachic role with regards to when the fruits of the tree ripen. 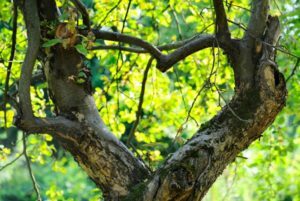 Hidden within this little-known law is a mystical secret that ties together the two “Tu” holidays of Judaism: Tu b’Shevat and Tu b’Av. 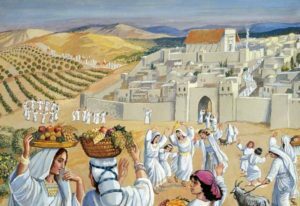 The holiday of Tu b’Av is most-associated with love and marriage, for the Mishnah (Ta’anit 4:8) states that on this day “the daughters of Jerusalem used to go out in white garments… and danced in the vineyards, exclaiming: ‘Young man! Lift up your eyes and see what you choose for yourself…’” Tu b’Av marked the start of the grape harvest, and on that day all the single ladies would go out to the vineyards to find their matches. It appears everyone would get married in one massive wedding, and so the Mishnah states that “no days were more joyous” for Israel. At first glance, it may seem like there is no connection between Tu b’Shevat and Tu b’Av, other than the fact that they are both on the fifteenth of the month, and take place exactly six months apart. Upon closer examination, one will discover the two are deeply linked. We saw above that a tree must be planted at least 44 days before Rosh Hashanah to be considered in its first year. The month immediately preceding Rosh Hashanah, Elul, has 29 days. Count another 15 days before that, and we find that 44 days before Rosh Hashanah is Tu b’Av! Thus, while Tu b’Shevat marks the start of a new agricultural season, Tu b’Av may very well mark its end, being the last day that a tree can be planted to qualify for its first birthday. Similarly, while Tu b’Shevat is important for the tithing of fruits, it is on Tu b’Av that the final fruit harvest of the year begins. The Mishnah states that the last major harvest of the year began on Tu b’Av and continued until Yom Kippur. 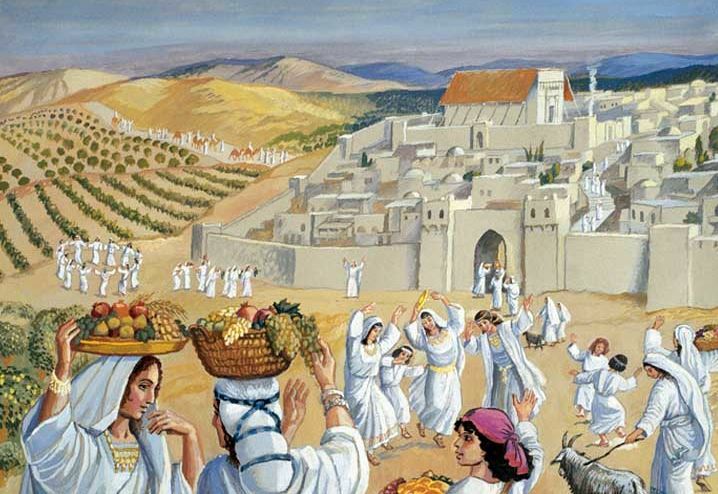 Then, on Sukkot, the nation ascended to Jerusalem with their fruits in hand to celebrate the final harvest festival. A new fruit begins its journey on Tu b’Shevat (when the earliest new year’s sap starts following in a tree, as the Talmud describes), and concludes its journey on Tu b’Av, by which point it is ready for harvest. 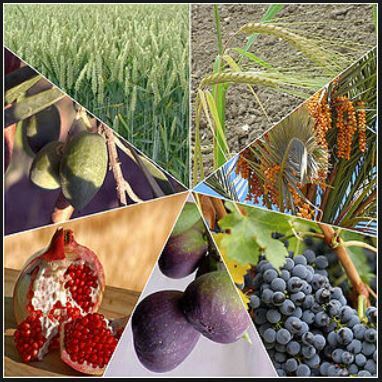 The ancient Israelites would begin working their fields on Tu b’Shevat, and reap their rewards on Tu b’Av. The young ladies would remind the bachelors that they shouldn’t select a bride based on her appearance, but that she comes from a good family, and has virtuous character. They go on to quote the famous verse from King Solomon’s Eshet Chayil that a God-fearing woman is better than a beautiful one. Peculiarly, the following verse, too, is added: “Give her from the fruit of her hands…” Some say it was the ladies who said this extra verse, while others say that this is what the men replied to the ladies. Whatever the case, the allusion to fruits is clear. 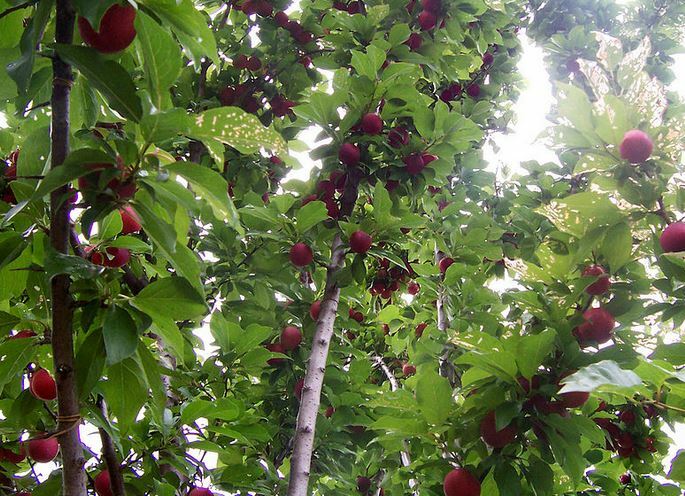 The hard work that began on Tu b’Shevat culminates in the fruits of that labour on Tu b’Av. The Talmud tells us that Tu b’Av was the last day of the year to harvest wood for the Temple. There was a special ceremony where the lumberjack’s axe was symbolically broken. No more trees would be felled until the following year. Tu b’Shevat might be a tree’s birthday, but Tu b’Av is a tree’s happiest day! We might say that trees and Jews have this in common—no day was “more joyous” for them. This brings us right back to where we started: the Tu b’Shevat seder prescribes eating a set of fruits culminating in those that are entirely edible, symbolic of our return to the Garden of Eden. In Eden, there was no need at all to fell trees. Man was in complete harmony with his surroundings. A tree could be eaten—even its bark and wood could be eaten—without any detriment to the tree, for nothing died in Eden. Perhaps the Breaking of the Axe ceremony was so important because it symbolized that return to the Garden, a return to a perfect world. It represented a future time when the nations “will beat their swords into plowshares” (Isaiah 2:4), when all weapons will be broken, when nothing will need to be destroyed. None will die, whether man, or the “man of the field”, as the Torah calls the tree (Deuteronomy 20:19). This brings us to one final insight. The major theme of Tu b’Shevat is trees, while the major theme of Tu b’Av is love. If the two holidays really are so intricately linked, what does the theme of one have to do with the other? When we ponder our relationship with trees, we recognize that we simply couldn’t exist without them. They provide us with food to eat and wood to build our homes. From them we derive life-saving medicines, indispensable compounds, and the very oxygen that we breathe. Amazingly, they require nothing in return from us. Trees are a lesson in unconditional giving. And this is the key to true love. Love can only flourish where there is unconditional giving. This is obviously true for a parent-child relationship. A parent gives endlessly to their young child, and expects little in return (while receiving a tremendous amount of stress, no less) yet loves the little one immeasurably. The very same is possible between spouses. It is certainly much more difficult, as we are partnering with grown adults and our expectations naturally tend to be high. However, if we condition ourselves to give unconditionally, we have the chance to develop the highest level of love. When each spouse carries that mindset, and learns to truly give to the other unconditionally, there is no doubt that the marriage will be fruitful in every way. This entry was posted in Holidays, Kabbalah & Mysticism and tagged Arizal, Book of Nehemiah, Breaking of the Axe, Daughters of Zion, Eshet Chayil, Fruit, Garden of Eden, Grape Harvest, Harvest Festival, Kabbalah, Kelipot, Love, Marriage, Mishnah, New Year, Orlah, Proverbs, Rosh Hashanah, Rosh Hashanah (Tractate), Seven Species of Israel, Ta'anit (Tractate), Temple, Temple Offerings, Tithe, Trees, Tu B'Av, Tu b'Shevat, Tu b'Shevat Seder, Wedding, Wood Offering on January 21, 2019 by Efraim Palvanov. This week’s Torah portion is Shoftim, “Judges” (not to be confused with the Biblical book of the same name). It begins with the command to appoint judges and officers, then describes many details of the justice system, as well as a long list of interesting laws. One of these laws is known as bal tashchit, the prohibition of not wasting resources, primarily based on the verse in this week’s parasha that prohibits soldiers from destroying fruit trees in the midst of battle (Deuteronomy 20:19). The famous passage concludes by saying “Is the tree of the field a man that it should go before you under siege?” The simple meaning of this verse is that a tree is not a human, has never wronged anyone, and does not deserve to be needlessly destroyed. However, the verse can also be read in a different way, as if saying, “Because the tree of the field is a man…” In fact, many of the sages throughout the centuries have interpreted the verse in this way, suggesting that trees are comparable to humans, and should be equally respected as important living creatures. After all, trees (and all other plants, for that matter) provide us with the oxygen that we breathe, the bulk of the food that we eat, as well as many of the vital resources we use regularly such as wood, fabric, and medicines. It appears that the very first thing God instructed Adam was to take care of the world that He created. Thus, being environmentally-conscious is undoubtedly a Torah mitzvah. Reducing our waste, limiting our consumption of fossil fuels, recycling, composting – all of these fulfil a divine command! Whenever we hold on to our water bottle just a bit longer so that we can put it in a recycling bin, we should keep in mind that this is a mitzvah. Whenever we choose to walk to that place down the street instead of firing up our gas-guzzling engines, we should keep in mind that this, too, is a mitzvah. This is all the more important today, with the health of our planet at its worst point in history. The air is unbreathable, the ice caps are disappearing, the oceans are strewn with garbage, entire landmasses are contaminated, and wildlife is suffering immensely. As God told Adam in the Garden of Eden, if we don’t do anything about this, we are jeopardizing our own existence, and there won’t be anyone left after us to fix it. In fact, the Garden of Eden was far more sensitive when it came to the balance of nature. It wasn’t just that Adam was tasked with guarding his environment and “keeping it green”. Eden was in a state of complete peace, where nothing living perished, and where fruit was the only food permitted for consumption. Meat was forbidden until the time of Noah, and even then, was initially only allowed under specific circumstances. It is safe to reason that with the coming of Mashiach and the inevitable return to a state of Eden, meat consumption will once more be forbidden*, and total peace in nature will be restored. Perhaps the current global rise in vegetarianism and veganism is a reflection of the world edging closer to Messianic times. May we merit to see it soon. 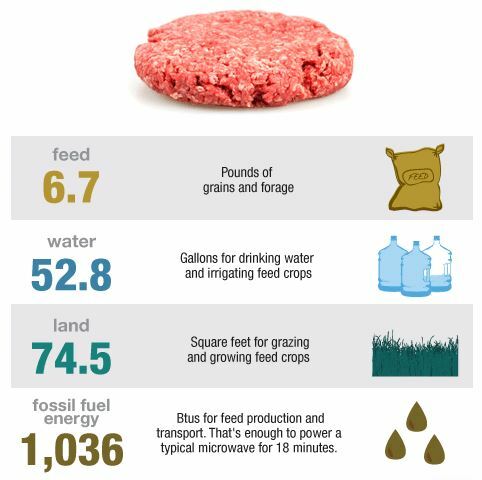 *If you are worried about this, artificial, lab-grown meat is on its way, and it will be healthier, too. Click here to learn more. This entry was posted in Jewish Law & Life Cycle, Torah & Science and tagged Adam and Eve, Bal Tashchit, Climate Change, Ecology, Environment, Food, Fruit, Garden of Eden, Global Warming, Green, Mashiach, Meat, Midrash, Noah, Pollution, Shoftim (parasha), Trees, Veganism, Vegetarianism on August 18, 2015 by Efraim Palvanov.